On Wednesday, Amanda and I received an email from a wonderful SLP we work with, sharing a few great AAC stories from her day. Hopefully they put a smile on your face as well. I particularly love the story about a student yelling. A few of us have discussed teaching students how to raise their voice when no one is listening to them. I see it as a very important skill, especially when adults are not acknowledging what they are saying or brushing it off as unintentional. I think the next step will be learning how to whisper. Finding ways to motivate older students can be difficult. You want to be age respectful while also providing instruction that is cognitively appropriate. 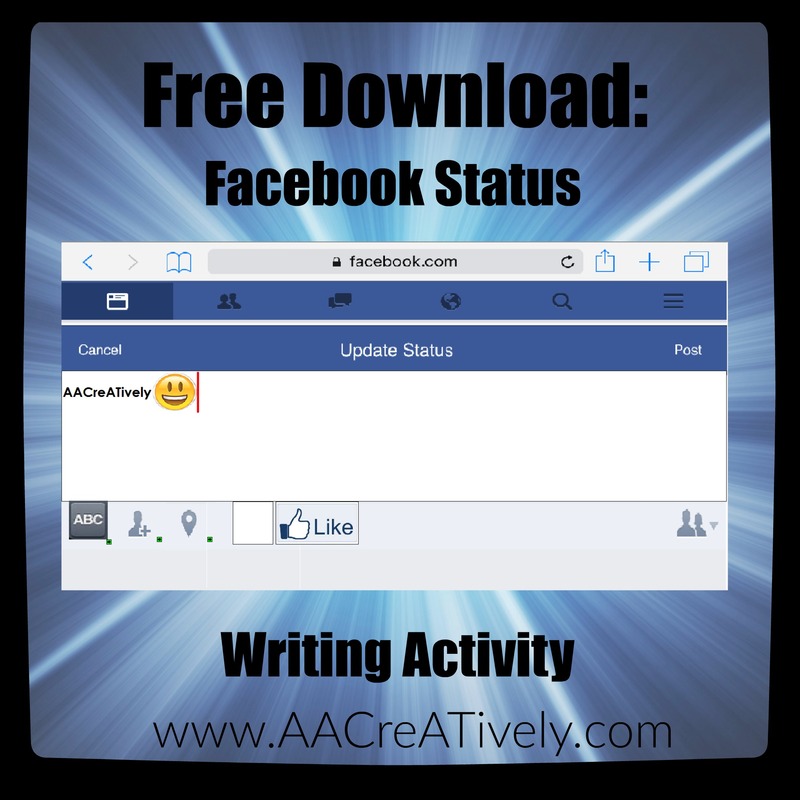 I created this Facebook activity as a way to increase student motivation during writing activities. 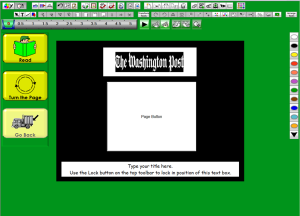 Students can write a status at the beginning or end of the day. The teacher can write the morning message as a status. Students can “Like” the status, they can use an emoji to show how they are feeling, check-in at their current location, or tag a classmate. Click here to download the activity. 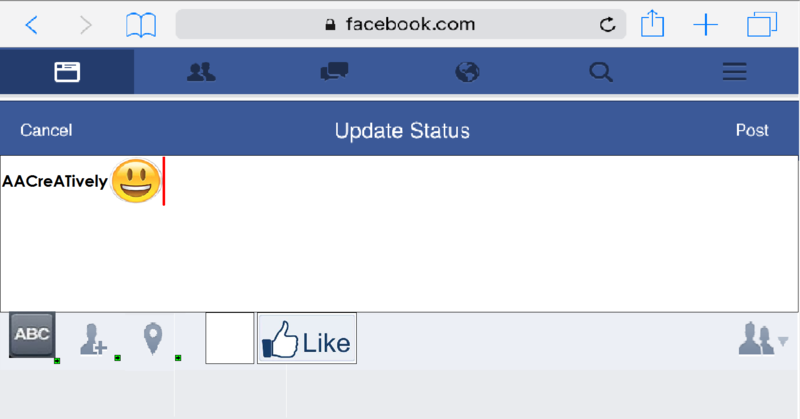 This is the main board for the activity (it is called “Facebook”). The other files are pop-up boards. 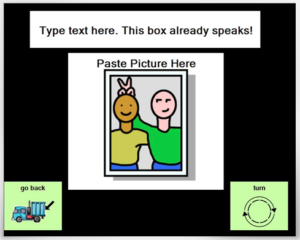 When working with a teacher in a classroom with AAC users, I often direct them to Gail Van Tatenhove’s resources on descriptive teaching (you can also find some great youtube videos modeling it). One of the classrooms I have been supporting in has 5, 5 year olds using high-tech. We have been doing shared reading every day after nap-time, and their teacher has been working on commenting on the text and describing what is happening on each page using their devices (with these supports). He is doing a great job using the supports and is beginning to model for the students without using them. The other day, he was having some difficulty coming up with things to model and one of his students said “DESCRIBE” on her Accent. He immediately began describing what was happening on the page. The timing was excellent and we all had a laugh. Don’t you love it when the students remind you of what you are supposed to be doing! 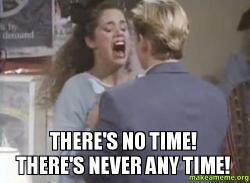 Have you felt like Jessie Spano lately? As educational professionals we never have enough time. Here in DC, we are right in the middle of testing season and it is STRESSFUL. As an instructional coach, I try to provide the teachers at my school time saving templates for activities whenever I can. 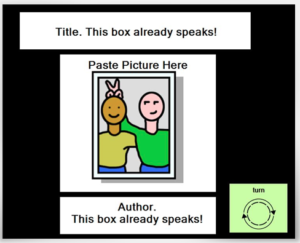 I recently made a template for creating switch accessible books in Boardmaker and thought I would share it with all of you! Each of the text boxes is set up to speak, so just change the text rather than deleting the box. The pages are set-up for step scanning (you can scan through the text, turn the page, and go back). The pictures are set-up do that they can’t be selected when scanning. If you wish to keep this feature, just replace the image in the button. Click here to download the book template. Click here to read about switch scanning in Boardmaker. 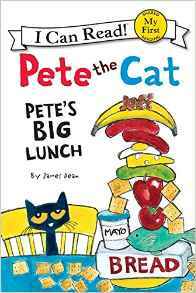 This week, the students have been reading Pete’s Big Lunch as part of their Speech and OT co-teach lessons. 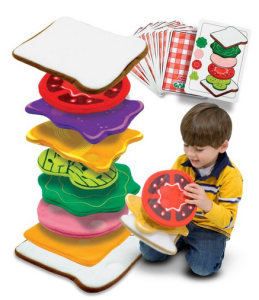 They have gone to the classroom “grocery store” and made a giant sandwich with this Sandwich Stacking Game. As a wrap-up lesson on Friday, we will be making actual sandwiches. 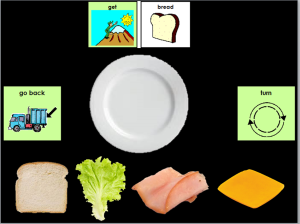 I made a quick PowerPoint activity to accompany the lesson. 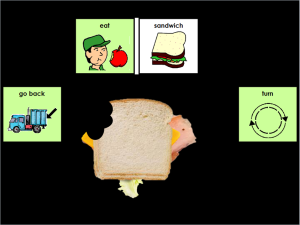 Students can choose each ingredient and build a sandwich. The best part comes at the end when they get to watch the sandwich disappear as it gets eaten. You can down load the PowerPoint activity by clicking here. Let us know if you use the activity. 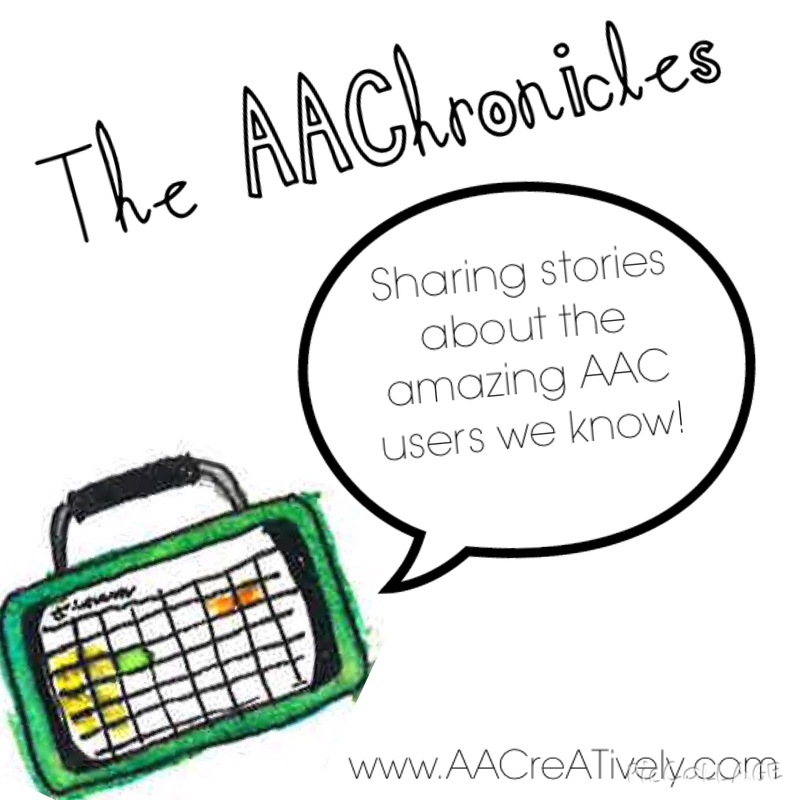 We would love to hear how you used the PowerPoint to enhance your lesson. This week one of our students discovered the word “hide” on his Accent. The classroom teacher and I immediately hid. This led to several games of hide and seek. The game created numerous opportunities to model new phrases. I have a feeling hide and seek is going to be very popular in that classroom for the next few days! 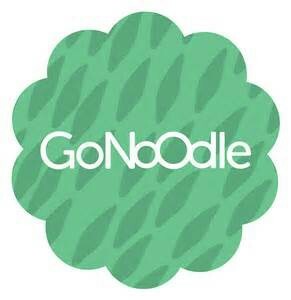 A teacher recently shared the website GoNoodle.com with me, and I love it! The website is a collection of “brain break” videos to use in the classroom. Most of the videos are no more than 5 minutes long and lead students in dancing or stretching routines. Schools also have the option of signing up for GoNoodle Plus which includes movement activities focused on teaching academic content. GoNoodle Plus costs $10 a month or $99 a year for a school. The free version still gives you access to hundreds of movement videos.